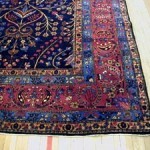 As with all well-loved and well-used rugs, eventually your oriental rug will need to be repaired. Repairing your oriental rug will restore it’s original beauty as well as improve it’s strength and durability for years to come. For owner Michael Sadigh, oriental rug repair services are what he does best. With over 20 years of professional rug repair experience, Persia Oriental Rug Gallery is your go-to for all your repair needs whether large or small. Reweaving. 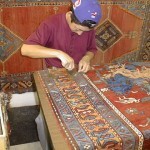 This is a specialized skill that involves repairing and patching holes or tears in an oriental rug. Using exact-match thread colors, tiny sewing needles, and magnifying glasses, that hole or rip in your rug will seem as if it never existed in the first place. Resizing. Love your oriental rug but find that it doesn’t quite fit into the space it’s intended to fill? 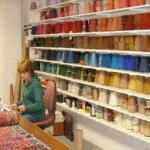 No worries — we provide rug resizing services on both machine made and hand-made oriental rugs. Our resizing services include decreasing or increasing the surface area of your rug using customized border additions to the perimeter of the rug. New Fringe. If your rug’s existing fringe is falling out or looking threadbare, opt for new fringe from Persian Oriental Rug Gallery. Our professional rug repair experts will help you choose the best fringe for your rug and taste and carefully secure it to your existing fringe. Overcasting. For oriental rugs that see a high amount of foot traffic, you may have noticed that your rug is unraveling around the edges. 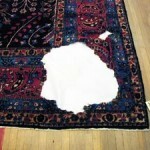 To prevent further damage from occurring, overcasting services for your rug is your best option. Overcasting involves exact-match yarn and sew the fringes back to their original appearance. Hand Binding. 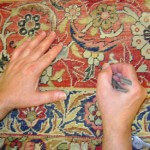 Give your hand-made or machine-made oriental rug a more polished and finished look with hand binding. The binding will match the field color of your rug so that it blends nicely into the rest of the carpet. Hand binding also prevents frayed fringes. Fixing any size hole. Whether big or small, Persia Oriental Rug Gallery’s professionals are here to ensure that your rug’s gaping holes are patched up in no time. We have patched hundreds of rugs that have included intricate patterns, multiple colors, and various pile lengths. Hand Edging. Carpet edging services are also available for those who prefer this look for their rugs. With edging, you can choose from a variety of types of carpet fabrics, such as wool, suede, polyester, cotton, or leather. We’ll ensure that your chosen fabric matches the color of your rug and will then attach the edging using either our precise machines or by hand. Blocking. 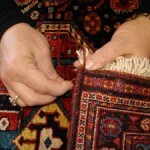 Rugs eventually warp and develop permanent wrinkles that are difficult to remove without the help from a professional. Rug blocking is a great option to restore your rug’s previous shape as well as to smooth out any wrinkles to avoid trip and fall accidents. Moth treatment and deodorizing. One of our most requested rug cleaning services, mothproofing ensures that no moths attack your oriental rug. Our professionals can also deodorize your rug if you suspect there is mold or mildew on the rug. Let Persian Oriental Rug Gallery restore your beautiful oriental rug back to it’s original condition at an affordable price. Contact us today to get a free estimate and learn more about each of our rug repair services.